I’m going to try to keep this post super short so you can get to cooking this delicious dip. 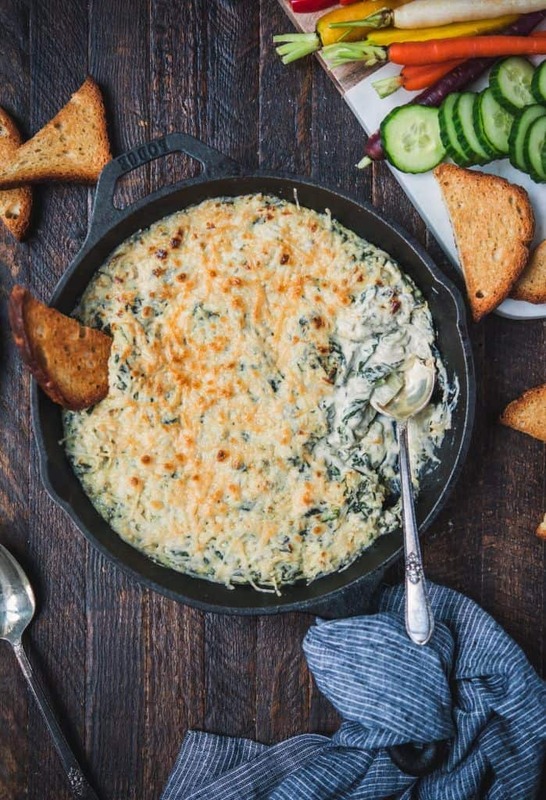 This vegan spinach artichoke dip is OFF THE CHARTS. You need to go make it immediately! 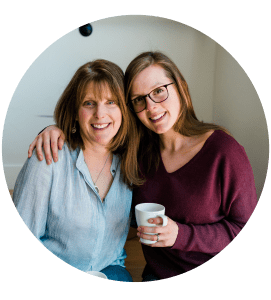 When it comes to recipes that involve vegan cheese, the rest of our family tends to be a bit skeptical. 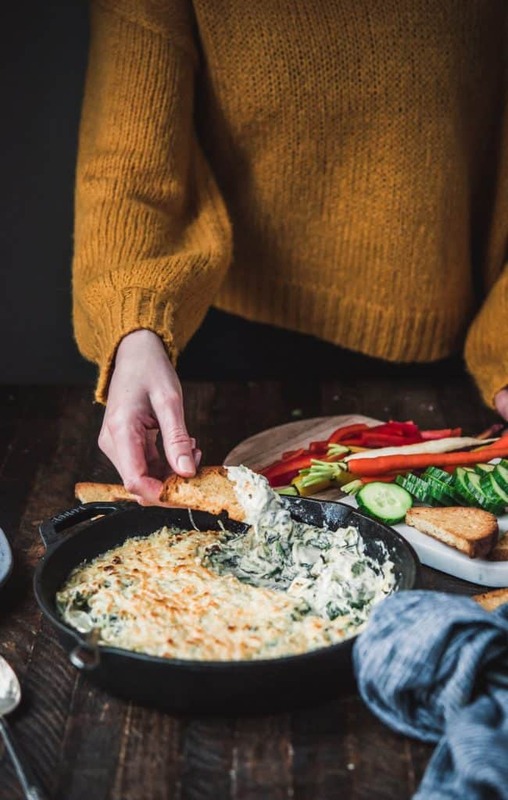 However, everyone agreed that this dip tastes really, really similar to the spinach artichoke dip they’re used to, made with dairy. Basically, all this dip requires is a quick sauté of shallots, garlic, artichokes, spinach and kale (kale is optional, but we love it). Then you’ll stir everything into the vegan cheese dip and pour it into a large skillet. Finally, top everything with a generous helping of vegan parmesan and bake for 5-7 minutes. You’ll know the dip is ready when it’s warm and the vegan cheese is slightly browned and bubbly. We serve ours with oven-toasted Canyon Gluten Free bread – it’s the perfect pairing! Before toasting, we brush each slice with a bit of olive oil, salt and pepper. Yum! 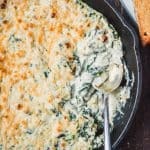 There are truly no words to describe this heavenly vegan spinach artichoke dip, so you’ll just have to try it yourself! In an 8 or 10 inch skillet, sauté shallots and garlic in olive oil until softened, about 5 minutes. Divide shallot/garlic mixture – half remains in pan, half gets added to the cheese sauce. Add artichokes to pan, continue cooking for a minute or two, then add greens and continue to sauté until greens are wilted – about 3-5 minutes. Remove skillet from heat. Meanwhile, add soaked cashews, water, lemon juice, olive oil, nutritional yeast, salt, pepper, miso, cayenne, vegan parmesan, vegan cream cheese and 1/2 of shallot/garlic mixture to a blender. Blend on high speed until smooth and creamy. Pour mixture into skillet and stir well to incorporate greens/artichoke mixture. Top with remaining 1 cup of vegan parmesan, then bake for 6-8 minutes, until cheese is golden brown and bubbly. You may have to rotate skillet a few minutes into cooking to evenly brown cheese. Cut each slice of bread in half diagonally and place on a baking sheet. Brush both sides with olive oil and sprinkle with salt and pepper. Bake for 10-15 minutes at 375 F until golden brown and toasted. 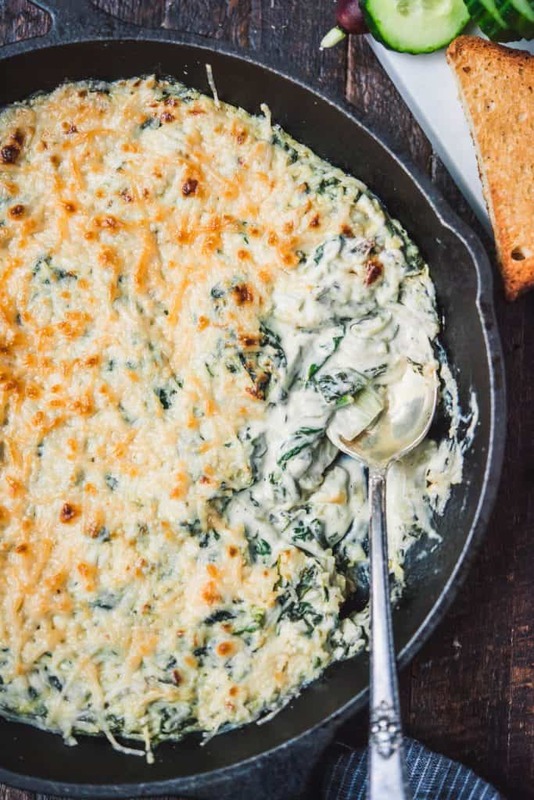 We used a mix of spinach and kale because the kale holds up nicely in the dip, but if you’d prefer to simplify, ditch the kale and bring the total amount of spinach to 5 cups.